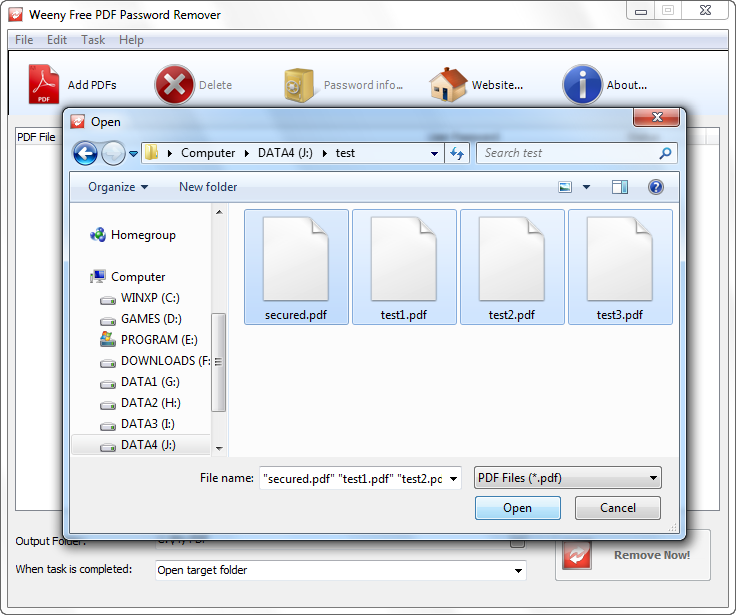 Free PDF password remover software to remove all PDF passwords and restrictions. Do you have PDF files which can only be viewed while cannot be printed, copied, or edited? These PDF files are password secured. Free PDF Password Remover is a free PDF software to remove all the passwords and restrictions in secured PDF files. Free PDF Password Remover supports removing PDF user password which is used to open PDF file and master password which is used to set PDF restrictions. Free PDF Password Remover can remove all kinds of document restrictions including printing, changing the document, content copying or extraction, authoring comments and form fields, form field fill-in or signing, content accessibility and document assembly. Free PDF Password Remover is very easy to use. Just add PDF files to the list, select output directory, and click "Remove" button to start removing passwords and restrictions. Free PDF Password Remover will prompt you to enter password if a PDF file needs user password to open. Free PDF Password Remover doesn't require Adobe Acrobat Reader installed. Free PDF Password Remover doesn't depend on any print driver so it will not install any print driver on your computer. Please note Free PDF Password Remover is not a PDF password crack software. You can't use it to retrieve lost password in a secured PDF file. Free PDF Password Remover can't remove PDF DRM protections or other third-party plug-in protections neither. Free PDF Password Remover works on Windows XP, Windows Vista, Windows 7 and Windows 10, both 32-bit and 64-bit versions. Click the download button above to download Free PDF Password Remover full version. Full version means the file is complete and doesn't require other PDF software, plug-in or printer to run. Full version also means Free PDF Password Remover software doesn't have any watermark, nag screen, time expiration or function limitations. Easy to use - A couple of clicks to finish PDF password removing. Free PDF password remover - Remove PDF user password which is used to open PDF file and master password which is used to set PDF restrictions. Free PDF restrictions remover - Remove all kinds of PDF restrictions include printing, changing the document, content copying or extraction, authoring comments and form fields, form field fill-in or signing, content accessibility and document assembly. Show password information - Show all passwords and restrictions information of PDF file. Support all kinds of encryption - Able to remove 40, 128 and 256-bit encryption passwords. Able to remove RC4 and AES encryption passwords. Stand-alone Software - Capable to effectively perform without any PDF printer drive or third party program installed. Weeny Free PDF Password Remover is a handy tool that allows you to remove restrictions in PDF documents, thus enabling you to edit, print or copy their content. Designed with ease of use in mind, the application enables you to browse for the files you want to use, set the output folder and remove the restrictions by simply pushing a button! Want to print, copy, or edit PDF files? As we all know PDF files can only be viewed despite the fact that it cannot be printed, copied, or edited because it is secured by password. This Weeny Free PDF Password Remover allows you to remove restricted PDF documents, and as a result, you can print, copy, or even edit a PDF file. This can also remove all kinds of document restrictions including printing, changing the document, content copying or extraction, authoring comments and form fields, form field fill-in or signing, content accessibility and document assembly. Weeny Free PDF Password Remover is a free PDF password removal software for Windows. With the help of this free password remover you can remove password protection and access restrictions from multiple PDF documents at the same time. Note that this will only remove passwords from PDF documents, you still have to know what the password is; this isn't a password cracker. It's very simple, without a lot of complicated menus to go through. You probably won't even need to use the standard menu in the top left corner seeing how everything that you need is located in the toolbar down below. All the PDF documents from where you need to remove password protection are gonna be listed in the large empty area in the middle. Output settings like output folder location and actions that you want performed upon task completion can be changed down below. Removing password protection from PDF documents isn't easy, especially if you have a lot of files from where you would like to remove password protection. Each file would need to be open individually and saved again without protection. Now with Weeny Free PDF Password Remover you can do that practically automatically, on multiple files at once. Here are few pointers to help you get started. Start by selecting the Add PDF's button from the toolbar at the top. Multiple documents can be opened at the same time, press and hold Ctrl or Shift on your keyboard together with left click, the usual, to select more than one file. Each one of the documents will have to have its password entered in the User Password column on the list. Left click on it so that the password can be typed. Do this for every document on the task list. At the bottom of the window set the Output Folder and what you want PDF Password Remover to do after passwords and restrictions are removed, open target folder, report and so on. When you're done, click on the Remove Now button. To check what was removed from PDF documents, select the Password Info button from the toolbar at the top. Once all the tasks are complete, you can open the output directory and collect the password free PDF documents. Weeny Free PDF Password Remover does a great job and it's very fast. All the passwords that we tested were removed, no matter how strong they were or what kind of restrictions the PDF documents had. Again, keep in mind that this is not a password cracker, it won't grant you access to password protected files, you need to know the password in order for it to be removed. Blazing fast and does what it says it will. Pros: Blazing fast and does exactly what it's supposed to. I had around 100 PDF files that needed the password removed so that I could combine them with Acrobat. It may be small, but it took all of 1 second for it to remove the passwords and restrictions from all of those files. Cons: Would be nice if it spanned across folders. Had to deduct a star for not having that as I've seen in other software. Summary: I tried different programs that claim to remove the passwords and restrictions in PDF documents with no luck. The last one I tried I had to stop after working for an hour...ON ONE FILE! "Weeny" is a keeper. It works much better than some *paid* software, and it doesn't have hidden limitations.